Roy Hennigh, owner of a grocery store in Sabetha, Nemaha County, wrote this letter to the governor concerning a recent visit to his store by a female deputy factory inspector. 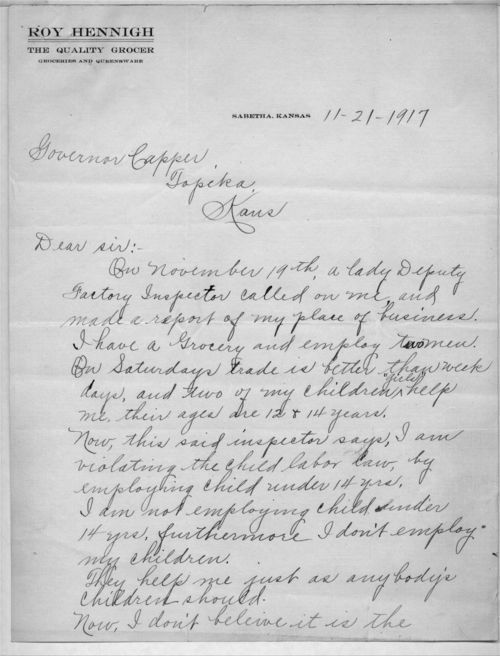 According to Hennigh, this inspector informed him that his two teenage daughters could not work in his store on the weekends according to the child labor laws. Hennigh argues that he does not officially employ his children, or any other children, because "they help me just as anybody's children should." He believes it is "very poor judgement to enact a law which forbids parents to use the help of their own children." He also takes issue with the fact that a female inspector evaluated his business. P. J. McBride, Commissioner of Labor and Industry, replied to this letter on December 12, 1917. This source illustrates one parent's argument against this child labor law (at least when applied to work within his store). Students could discuss what forms of labor should be regulated under child labor laws. It could be grouped with P. J. McBride's response, or when combined with the other letters from Sabetha citizens (like Ralph Tennal and Emma Grimm) this could form a case study of how this law was applied in small-town Kansas.